This home on 69th Road was torched Dec. 5, police said. The suspected arsonist had first tried to burn down the home in November but the fire department got to the home before it spread. QUEENS — The “ninja” arsonist who's been torching McMansions in Forest Hills is likely a longtime resident fed up with gentrification in his neighborhood and the fires he sets makes him feel he has the power to stop it, experts tell DNAinfo New York. Louis Garcia, the city’s ex-chief fire marshal and a nationally recognized expert on arson, said the man behind at least seven Forest Hills blazes is infused with power every time he sets a home on fire — attracting increased police and public attention. “He probably was someone who felt powerless to stop the gentrification and now feels he has power over them by burning their property,” said the 35-year veteran FDNY commander who spent 25 years in the Bureau of Fire Investigation and a decade as the city's chief fire marshal. ► He left a coded message near the scene of a recent fire that sent police on a wild goose chase after the wrong suspect. ► Then he returned to the scene of a previous fire — torching it a second time and thumbing his nose at the police because he apparently knew that investigators hunting for him would not be there. Over the years, Garcia and his marshals investigated thousands of arson fires, but only about a dozen involved serial arsonists, he said. Most of them fit a general profile of someone who was a loner with a high school degree who spent their entire lives in one neighborhood. They frequently began to feel "invisible" watching an influx of different types of people move in, he said. And then they feel "powerless" as their favorite hangouts and stores begin to change hands, or disappear completely. For example, Garcia recalled a rash of fires in northern Queens a decade ago where the arsonist was opposed to Koreans moving into the neighborhood. Investigators eventually speculated that the suspect likely was drinking in bars 'til closing time and then setting fires because most were committed around 4 a.m.
"He was a local white guy who made racist statements about Koreans after we caught him, and so did his whole family," Garcia said. He also recalled a serial arsonist responsible for nearly 400 fires in Brooklyn in the 1980s. He turned out to be a drug addict from a solid middle-class family who torched luxury cars and property belonging to affluent people because that made him feel powerful over them. 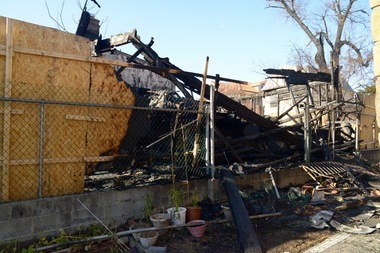 In Forest Hills, five of the fires targeted homes that are vacant or under construction. They're owned by Bukharian Jews who are increasingly moving into the Cord Mayer section of the neighborhood, between Jewel and 65th avenues and between Queens Boulevard and the Grand Central Parkway. Investigators believe the motive is more likely to be an effort to stop the construction of large homes that do not match the traditional character of the neighborhood, and not an attack on Jews. “We think the motive is probably not anti-Semitism, but anti-aestheticism,” a law enforcement official said. Garcia agrees, but says the Forest Hills serial arsonist is “probably also not a fan of" the Bukharians. The release of surveillance videos of him has not deterred the ninja. In one video released by police, the suspect appears to be carrying a gun. “This is his territory," Garcia said. "Right now, he is in control.